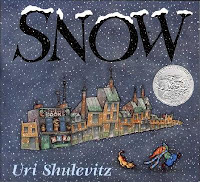 I started out with Snow by Uri Shulevitz. This is a perfect, quiet book to express the anticipation you feel when you're wishing and hoping for snow. One snowflake falls and the little boy cries out, "It's snowing!" Though all the adults, radio, and television say it's not going to snow, the snowflakes have a way of piling up until the entire city is covered in a blanket of white. 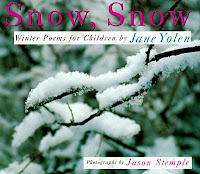 So, we had our snow on the ground and next I read a poem from Jane Yolen's book Snow, Snow: Winter Poems for Children. I read the poem "Snow on the Trees" and talked to the kids about how I think this poem makes me feel that hushed, quiet feeling like when the whole world is covered with snow and everything is silent and white. Since we had snow covering everything, I decided we'd better make snowmen and I read Snowmen at Night by Caralyn Buehner. The fun, rhyming text and exhuberant illustrations make this one of my favorite winter stories. After sharing that book, I asked the kids to help me make a snowman and as they acted out the gathering of snow, rolling of snowballs, etc. I "built" a snowman from our story prop. It was constructed with styrofoam balls and some odds and ends. Very easy and cheap to make and the kids absolutely loved it! If you have a small enough crowd (or enough pieces - you could add arms and front buttons to what we have here), you can have the kids place the objects to make the snowman. 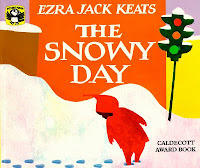 I shared a big book version of The Snowy Day by Ezra Jack Keats. This is a classic and one of my favorites for kids of all ages. 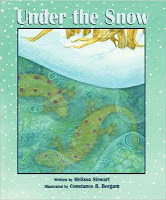 And I read parts of Under the Snow by Melissa Stewart. This non-fiction picture book talks about different animals in the forests, fields, and ponds and what they do when the weather gets cold. Frogs and turtles hide under the mud and barely breathe. Ladybugs bunch together in crevices. Voles burrow under the snow and eat the bark off trees. To read the entire book might be a little much for storytime, so I paper-clipped some of the pages together. I had a great bunch of kids for my storytime and a good time was had by all! Here's hoping this helps you with your winter story requests this year! I'm bookmarking this post for picks for my 5 y/o. Thanks! I still have not seen Under the Snow. I have got to got to check it out. 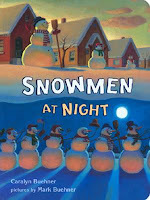 Sounds like such a fun storytime, and I really like the making-a-snowman idea. Must remember that, too.